PF-04217903 is a MET tyrosine kinase inhibitor, is also a n orally bioavailabe, small-molecule tyrosine kinase inhibitor of the proto-oncogene c-Met (hepatocyte growth factor receptor [HGFR]) with potential antineoplastic activity. 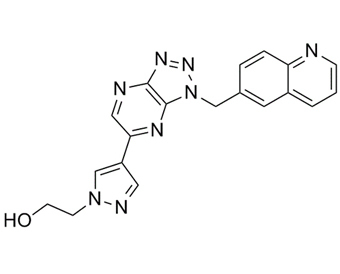 c-Met inhibitor PF-04217903 selectively binds to and inhibits c-Met, disrupting the c-Met signaling pathway, which may result in the inhibition of tumor cell growth, migration and invasion of tumor cells, and the induction of death in tumor cells expressing c-Met.
. Timofeevski SL, et al. Enzymatic characterization of c-Met receptor tyrosine kinase oncogenic mutants and kinetic studies with aminopyridine and triazolopyrazine inhibitors. Biochemistry, 2009, 48(23), 5339-5349.
. Shojaei F, et al. HGF/c-Met acts as an alternative angiogenic pathway in sunitinib-resistant tumors. Cancer Res, 2010, 70(24), 10090-10100.